The first quarter of 2012 has been the most successful one in the history of QSX Instruments. It is the type of quarter we expect at this point. We offer a great product and our after the sales service/support is second to none, eventually word gets around. Plus, the cost for a good performing XRF has always been too expensive for most of the smaller companies but our line seems to meet that need. The Quickshot XRF line has focused on precious metal identification solutions – but what other applications are you most excited about the lines abilities in? RoHS testing applications. Offering both handheld and desktop systems for this interest lets us speak to the benefits that each model provides and suggest the best fit for a potential end-user. When looking at the desktop system, the low cost Si-PIN system provides excellent results for RoHS screening needs while the SDD version reduces the measurement time by about 3/4 less but with top accuracy. 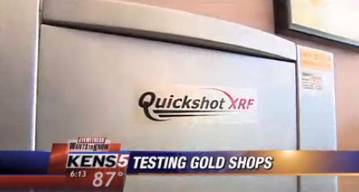 Looking at gold testing solutions; the line includes a handheld system but desktop models are the first suggestion. Why is that? The handheld systems work well for what they were designed for, portability and field use. We find that many gold buyers use the ‘x-ray guns’ positioned so that the beam is pointed upward and they place parts on the nose of the gun. This method works fine, but radiation may be emitted unless they have a part that is flat, thick enough and totally covers the aperature of the unit. We sell bench top models for about the same cost and they emit zero radiation because the part is placed inside a chamber and the analyzer will not operate unless the door is closed. Additional benefits of the desktop models are the streamlined software with excellent report generation, and the potential cost of ownership advantage that comes from a system operating at 1/10 its max power compared to a handheld that must run at max power to obtain similar results. Gold buyers need to consider the long term benefits of the investment and I have asked our sales staff to provide information for them to consider. What is your favorite Quickshot XRF analyzer? Why? The newest analyzers; the QSX-295Tplus and QSX-82D. These instruments are well thought out designs with specific goals in mind. The speed and accuracy offered should make it hard to choose any other products. What changes stand out from your twenty(plus) years involved in XRF? Well, all the obvious answers apply here…greater range of applications, faster measurement speeds, the introduction of field portable systems (handheld XRF) and software design. I am most proud of the Quickshot XRF software packages which our clients consistently note as being streamlined and simple to navigate. How do you see the remainder of 2012 for Quickshot XRF? We look forward to continuing the upward trend that we are on; thanks in large part to our satisfied clients telling their peers about the solutions we offer. However, we are also excited to broaden our application reach with the handheld system and some potential new releases. Stay tuned; we are excited and we believe people interested in XRF will be as well.